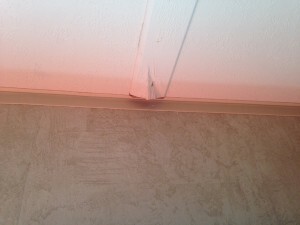 My horrible experience purchasing a new RV from Bent's RV in Metairie, La. Note: All blue text on this page is the body text from emails. 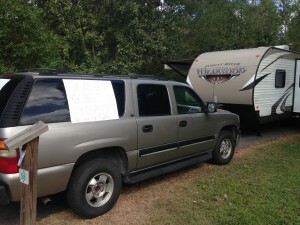 When I purchased my new camper from Bent’s RV in Metairie, Louisiana, I got a little surprise with it. The surprise, a fee called a “Dealer Prep Fee”. This fee of $450 was pitched as a fee to cover filling the propane tanks, installing a battery, a full cleaning inside and out and for the dealership to connect water and power to do a final inspection to check for burned out lights, leaks etc… and make sure there were no problems with the RV. I was a little hesitant because I believe most of this should come with the purchase anyway. But, I figured I had no choice but to pay the fee. Foolish me picked up the camper a week later and didn’t completely inspect everything because I figured they would actually have everything in order. 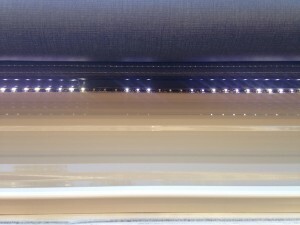 I did inquire about the LED light strip under the awning as it appeared to have some lights out. The salesman, Barrett said it was where the light strips connections were and was normal. Once I got home, I looked further into it and figured out that there are actual bulbs that are burned out. Little did I know, I would find a few more surprises when I got home with it. 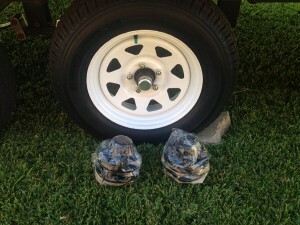 Upon walking into the camper after I got it home, I noticed that the caps for the rims that cover the lugs were still sitting on the couch, wrapped in plastic. I thought to myself, Why did we have to pay a fee? No biggie, I installed them in under a minute. Now it was time to start moving items from the old camper into this one. I opened a drawer to put some items in it and noticed the face of the drawer was almost completely off. My first thought was they should have caught this during their so called inspection. At this point, I figured I should start inspecting this thing and see if I could find anything else. A few minutes of looking would lead me to know that there was NO WAY POSSIBLE that anyone really did any kind of inspection on anything. The drawers had sawdust in them left over from the manufacturing, the appliances appeared dirty with finger prints all over the place, a crack in the table and there is either a defect or damage to a part of the molding on the ceiling. After going through the camper, I have to ask, what was the $450.00 prep fee for. I have to ask cause we were given the impression that it was for you all to go over the camper with a fine tooth comb as explained at the time of the sale. We have noticed a few things. The table has a crack on the edge that goes clean through. The ceiling has what appears to be a defect. 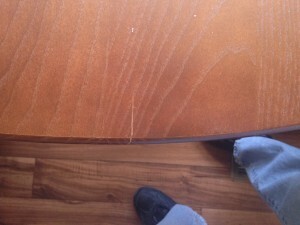 The drawer face under the table is coming off of the drawer. Some of the LED lights on the awning are out. While I completely understand the possibility of defects, I don’t understand why these weren’t caught during the so called inspection. To me, the inspection part was to prevent us from having to come back. Even though all things may not be caught, these were blatantly visible. To be perfectly honest, I think whoever was responsible for this part of the deal really dropped the ball. 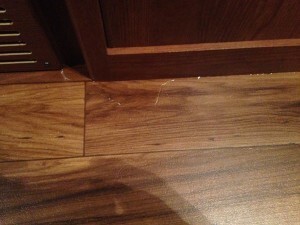 Even the saw dust from the manufacturing of the drawers is still present. I wold have expected that this would have been vacuumed out. When you buy a new car, it gets detailed inside and out. It appears that the interior was not touched at all. We really feel taken advantage of when it comes to that fee. The next morning, I got a call from Mario apologizing about what I had found. He said in the phone call that I should have been notified about all of this when I picked the camper up. He stated that everything was on order already and when the items came in, I would be notified. He also volunteered a special wash and wax job for my inconvenience. I declined the wash and wax cause i was told that it had already been washed and waxed when I picked it up. He said I must have misunderstood what was said cause they don’t normally wax them. I countered with, there was no way I misunderstood. I distinctively heard the sales man say “here is your new camper, Mr. Graves. Shes all washed and waxed and ready for you.” I also said to him on the phone that I didn’t know who to believe now, cause someone had to be lying. I was also informed that a spare tire does not come with the camper but they would sell me one at cost. I decided to decline the offer. This is where the real fun starts. When I suggested that I be refunded the so called prep fee, they started referring to it as a “Supply Fee”. Mario said he would talk to his boss and get back with me. When I didn’t hear back the next day, I emailed the owner and never got a response. I would post that email but my lovely iPhone somehow lost the content of the email. Y’all hold on. It gets better. It’s now time for the first camping trip. I get out to the campground and hook up the power. All is great. Time to hook up the water. I turn on the water and can instantly hear water pouring out under the camper. Upon a little investigating, it was coming from the drain that you would use to drain the lines for a freeze. No biggie. I closed them and moved on. But I once again thought about that inspection. Why would those be left open if they had pressured up the water lines during the inspection? The camper has now been hooked up to the water for about 30 minutes. This is when I notice there is water on the floor. The first thing that I thought of was a broken line. Just great! Luckily, it turned out it was loose lines on the sink faucet. Just another thing that should have been caught during that so called inspection. The camper also needed a good sweeping. 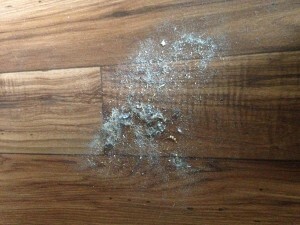 The photo below shows what was swept up. I emailed the following photo to the sales manager on Wednesday, 10/21/2015 @ 10:18PM. The email was titled “Leaks”. On Friday, 10/23/15 @ 7:59AM I got the following email from Mario. I’m sorry that I haven’t responded to your email. Ive been home sick for the last 3 days. I see that you have a leak, I will forward this to Freddie our Service manager so that he can schedule you in asap. I responded with the following email and informed him that I had already taken care of it. Hope you’re feeling better and all is well. No need to schedule service for the leak. I already fixed it myself. It was loose fittings under the sink. Another example of proof someone failed to go through this trailer. If it had been an actual defect in the plumbing, my whole camping trip may have become a big headache filled trip. I hate to keep harping on it and hope you can understand my frustration. Did you hear from your boss yet? It’s been 5 days and I await a response. I would really like Brian to give me a call. At this point, I am really beginning to become very frustrated. I have called several times and sent emails to the owner. Several calls and messages were left for Mario to call me back but I don’t get a response. When I finally get in touch with Mario, he tells me that they will only take care of fixing the problems. Basically I will not be getting refunded the fee. I told him that I was at the point that I was gonna give up and just accept that I had gotten the shaft. Before hanging up, I informed him that I had one more photo to send him. I sent the following email and photo to Barret, Mario and the owner on Friday, October 23, 2015 1:19 PM. I titled it “Free advertisement”. It is kind of hard to see but the sign reads “Ask me about my Bents RV experience. We got the shaft”. After a week of calling, I wasn’t afforded the courtesy of a return call or email. I had to call back twice today to finally find out in the end that the so called prep fees are still being called supply fee. There is no way that $450 worth of supplies were added to the camper. Y’all got me this time but I will make sure you all don’t ever get me or anyone I know in the future. The next installment of free advertisement will come next week when it hits all the websites that I run. Funny. About an hour later, I finally get the following email from the owner. The email was received Friday, October 23, 2015, at 2:42 PM. I am sorry that my schedule is very busy. I have managers to work through these issues. I would hope that you can understand that. What do you want that was not delivered to you other that our desire to properly clean the camper and fix the items that were obviously overlooked? We strive to make our customers happy, but we are human and we do fumble sometimes. On Friday, October 23, 2015 4:21 PM I replied with the following. I’m sure you are quite busy and I can understand that. I just couldn’t seem to get a response from anyone else. Even today when I called for Mario, I was told by the receptionist that he would return my call. Several hours later, I still had not heard back from anyone. I’ve been trying to speak to someone since this started on Monday and couldn’t get a response. I couldn’t help but feel that I was being ignored. I’m also certain you have plenty of satisfied customers. I was one of them until all of this started. I’ve been shopping for RV accessories at your business for years cause of your fair pricing and the knowledge of your staff. Other than the items that are defected, you can’t really go back and fix anything. I have already fixed the leak and my wife cleaned the inside so we could use it for our trip this weekend. Let’s be realistic here. Let’s go ahead and call it a supply fee. What did you all add that totaled $450? I’m being told propane and a battery. That’s some expensive propane and one heck of a battery. On Friday, October 23, 2015 5:57 PM, the owner replied back. Several years ago, our competitors had lowered their advertised prices of their campers and added these supplies just like we do. We had to do the same to remain competitive. At that time, we figured out all of these costs to come with our prep charge. – a walk through to show you all aspects of your camper. Some customers know some of this, but all of our customers are given the same full demonstration for all the functions on the camper. ( The campers have a lot more items to learn than a car!) Our retail labor rate is $119 per hour. – Battery and Battery Box and labor to mount the box. I assume that you also received these items above. If not, let me know and we can make sure that you get them. On Friday, October 23, 2015 6:35 PM I replied with the following email. Yes, I did receive all of that but I don’t really consider those to be “supplies”. I didn’t really ask for those things either. I guess we just won’t really get anywhere with this but I would like to add my comments on the things that you mentioned cause most of these items were not mentioned as part of the fee. If they had been mentioned, I most likely would not have agreed to pay them. In the end, it would probably have been a deal breaker. I’m sure that most everyday consumers would agree with me. The following items were never mentioned as being part of that fee. 1. The gift certificate. It’s not really a gift if I have to purchase it myself. 2. The 15 free nights of camping. Those appear to be related to some time share. I consider all time shares to be a scam and always avoid them. 3. RV club membership. While I may actually use it, it probably won’t be enough to make me feel like the fee was worth it. 4. The walk through. Hmmm. How long does this normally take? I ask this cause all I was shown was the slide being drawn in, how to turn on the LED lights and given a pamphlet when I inquired about the tongue weight. This took less than 15 minutes. At the campground, I had to get out the manual to get the water heater to operate on electrical power. It lit up on propane when I turned it on. Little did I know there was a separate switch on the heater for electrical operation. It may be a big inconvenience to me but I most definitely see myself visiting another dealership in the future to have warranty items taken care of. As mentioned in past emails, I have always been happy with going to you for parts and accessories but I just won’t be able to do it anymore with the way I now feel. You are quite the salesman. I usually feel like I am experiencing anxiety when making a purchase that involves a salesman. With you, I really felt comfortable throughout the sale. Stupid me for letting my guard down and not keeping in my mind that old phrase “let the buyer beware”. In the future, you may want to consider being up front and a little clearer with the customer about what is included with this fee. It may prevent a lot of frustration in your customers. At this point, I am most certainly a unhappy customer. Wanted to check in and find out if the parts came in so I can schedule a time to bring the camper in for the items to be replaced. I never got a response. I called again on December 2, 2015 to find out the status of what was going on with replacing the damaged items and fixing the broken drawer face, etc… I spoke with Mario. He had the nerve to act like he couldn’t remember the exact items I was talking about. Unless they have arguments via telephone and email with all of their customers, I have a hard time believing that he had a hard time remembering who I was, the situation, or what the call was about. I really think that he feels that he made the sale, now he is done with me. No matter what, I will never do business with them again. Any parts or accessories will be ordered from Amazon before I go through them again! In the end, the service department informed me that I could bring the camper in on Friday, December 11, 2015 to have the items replaced/repaired. We shall see what happens. I will follow up on how it goes. Brought the camper in last week to have the warranty work done. 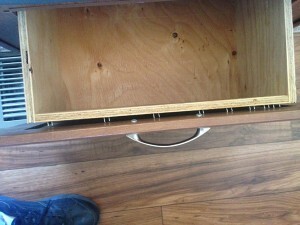 The lights were fixed, the drawer face also repaired and table was replaced. The molding on the ceiling is the same. Lord only knows what else. Now that this chapter is over, time to move on. If I ever need warranty work, looks like I will be bringing the camper to the north shore. I’m still out that blasted $450.00 prep fee. Guess once the sale is done, that’s all that counts to the Bent’s. I can promise you this, they shall never get me again. Screw me once…. You won’t get a chance to screw me twice!